RED DEER - The G.H. Dawe Community School in Red Deer is one of five recipients of quarterly grants recently awarded by the Hockey Alberta Foundation. Along with the G.H. Dawe School, grants were awarded to the Sturgeon Hockey Club, the Lethbridge Minor Hockey Association, St. Albert Minor Hockey Association, and Bashaw Minor Hockey Association through the Foundation’s Every Kid Every Community program. G.H. Dawe School has earmarked its $4,250 for a learn-to-play program for students, where all the necessary equipment will be provided. Carmichael explained that last winter, the school had a sports expert assess the skates. It was determined that at least half need replacing, and that the school also was in short supply of helmets. “With the generous grant from the Every Kid Every Community program, we will be able to purchase many pairs of used skates, and new helmets,” said Carmichael. “For the first time, we will be able to start a learn-to-play hockey program during Middle School options. A huge thank you to the Hockey Alberta Foundation!" Through all of the Hockey Alberta Foundation’s TEAMMATES, including ATB Investor Services, Quinn’s Energy Group of Companies, the Piper Creek Optimist Club of Red Deer, the Glencross Legacy Fund, and Serdachny Hockey, these grants are made possible for communities throughout the province. The deadline to apply for the next set of quarterly grants through the Every Kid Every Community program is November 30. For more information on how to apply for a grant, click here. 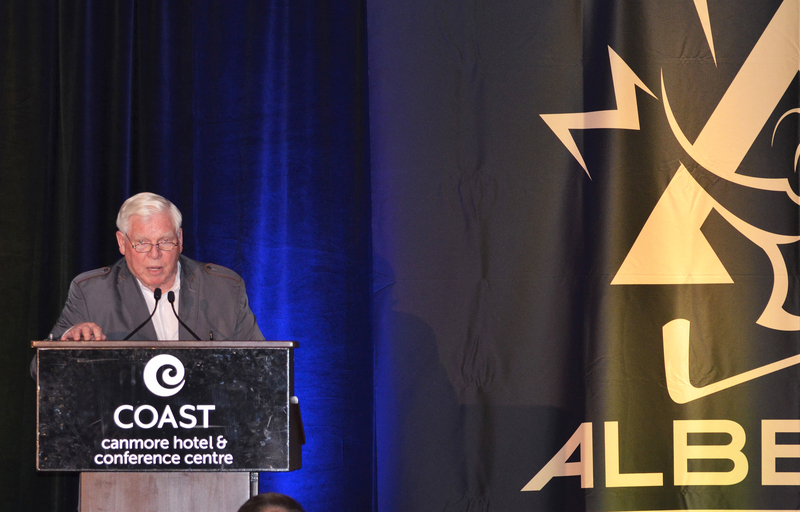 RED DEER - Five outstanding individuals, along with the only Alberta team to win back-to-back Memorial Cups, comprise the 2019 Induction Class for the Alberta Hockey Hall of Fame. We invite you to celebrate the legacy of these Alberta hockey legends on Sunday, July 21 at the Coast Hotel in Canmore. For ticket information, click here. LEDUC – Icy temperatures may have garnered the big headlines across the province. But it was a generous donation, on national television through Rogers Hometown Hockey, by the Gord Bamford Foundation to the Hockey Alberta Foundation that provided the hot news. Bamford was one of the special guests in attendance as part of Rogers Hometown Hockey, and he showed his love for the sport, and the kids who play hockey, in two ways. When Bamford took to the stage for a song, he was proudly sporting a Team Alberta jersey. Then, he presented Tim Leer, the Executive Director of the Hockey Alberta Foundation, with a cheque for $10,000 in support of the Every Kid Every Community program. The generous donation will help ensure that any child in Alberta who wants to will be able to enjoy the game of hockey through the EKEC grant program. This weekend in Leduc was also a big weekend for female hockey in the province. The Alberta Female Hockey League (AFHL) Midget Elite Showcase saw all 12 teams in the Midget Elite division on the ice for a total of 18 games. Game results, and a summary of what happened in the AFHL in January, can be found at the league’s website, afhl.ca. RED DEER - The Hockey Alberta Foundation has been accepted as a participating charity in the 2019 Birdies for Kids program. This fundraising program is designed so that the Hockey Alberta Foundation will receive 100% of every donation accepted on its behalf and allows for additional funding of up to 50% of the original donations made. The Hockey Alberta Foundation’s goal is to provide every child in Alberta the opportunity to play hockey, have fun and, in many cases, experience the sport for the first time through programs like Every Kid Every Community and Future Leaders. Hockey is a great way for kids to be active, healthy and surrounded by positive leaders in their community. Keeping kids active in sport helps reduce childhood obesity, creates a safe and fun environment and forms friendships. Donating is easy and open now! Visit shawcharityclassic.com/donatenow/ and select ‘Hockey Alberta Foundation’ to donate online. Shaw Birdies for Kids presented by AltaLink is a non-profit program run under the Calgary Shaw Charity Classic Foundation. The Hockey Alberta Foundation, in conjunction with Vegreville Minor Hockey and KidSport Vegreville, is bringing the Every Kid Every Community (EKEC) Speaker Series to Vegreville. The evening will feature former NHL players Rob Brown and Jason Strudwick in a candid Hockey Hot Stove. Tickets for the event are $50 for individuals or $350 for a table of 8 and includes a buffet dinner, door prizes, live and silent auctions, and entertainment. All proceeds from the event will go towards Vegreville Minor Hockey, KidSport Vegreville and the Every Kid Every Community program. RED DEER - The Hockey Alberta Foundation is excited to once again partner with the Piper Creek Optimist Club of Red Deer for the third straight year to present the Battle of Alberta Fundraiser, benefiting the Every Kid Every Community (EKEC) program. In two years, the Battle of Alberta event has raised over $40,000 for EKEC, as well as $8,000 for additional youth programs in Central Alberta. The event runs on Saturday, January 5 at Bo’s Bar and Grill in Red Deer, in conjunction with the Toronto Maple Leafs vs Vancouver Canucks (4:30 p.m.) and Edmonton Oilers vs Los Angeles Kings (8:00 p.m.) on Hockey Night in Canada. The gold medal game of the World Junior Championship (6:00 p.m.) is also set for January 5. Red Deer Rebels game-day host, Troy Gillard, will be the night’s Master of Ceremonies. The night will also feature a Hockey Hot Stove with NHL alumni Curtis Glencross, Jamie Macoun, Brian McGrattan and Colin Patterson. Four tickets to the January 19 Edmonton Oilers game against the Calgary Flames at Rogers Place, and a limo ride from Red Deer to Edmonton, and back. Four tickets to the April 6 Calgary Flames game against the Edmonton Oilers at the Scotiabank Saddledome, and a limo ride from Red Deer to Calgary, and back. Tickets are $40 each, which includes snacks (courtesy of Bo’s), one beverage, and entry into the hourly draws, early bird draw and both grand prize draws. A WestJet raffle prize (two tickets for anywhere WestJet flies, sold for $20 each), a 50/50 draw, and silent auction items will also be available throughout the night. As the organizers of the event, the Piper Creek Optimist Club has generously allocated the proceeds to the Every Kid Every Community program, which will go specifically to help Central Alberta kids into the game of hockey. Only 400 tickets are available, and are sold on a first come, first served basis. To purchase tickets, or for more information, please email pcobattleofalberta@gmail.com. The Hockey Alberta Foundation would like to thank all of the generous sponsors of this event: the Piper Creek Optimist Club of Red Deer, Bo’s Bar and Grill, Edmonton Oilers Community Foundation, Calgary Flames Foundation, ATB Financial, ATB Wealth, Black Crown Garage, WestJet, the Molson Coors Brewing Company, Your Wedding Place and the Frère Realty Team. Teammates Helping Teammates - Send your team to see the Calgary Flames! RED DEER - Hockey Alberta Foundation, in support of the Every Kid Every Community Grant Program, is reaching out to our TEAMMATES in minor hockey communities across Alberta. Throughout the hockey season many teams, focus fundraising efforts on a charity of choice to support. We hope you will consider your teammates at the Hockey Alberta Foundation as your hockey charity of choice. We have launched the Teammates helping Teammates raffle in support of the Every Kid Every Community Grant Program. There are only 100 tickets available. Tickets are available for $100 each and can be purchased by cash, cheque or credit card by contacting the Hockey Alberta Foundation office or completing the online form. The deadline to purchase tickets is 12 noon on March 25, 2019, or once all 100 tickets are sold. Draws will take place at 2:00pm on March 25 at the Hockey Alberta Office in Red Deer. 25 tickets to the Calgary Flames vs Anaheim Ducks game on Friday, March 29th, 2019. Transportation via motorcoach to and from Scotiabank Saddledome. Buy your ticket today and help us raise $10,000, and together, we as TEAMMATES can give Every Kid in Every Community a chance to play hockey. RED DEER – For the second consecutive year, the Glencross Invitational Charity Roughstock Event is contributing $190,000 to two central Alberta charitable organizations. Hockey Alberta Foundation, and its Every Kid Every Community program, and the Ronald McDonald House in Red Deer, will share the proceeds. The 2018 event, which was co-sponsored by ATB and Calgary Flames Foundation, was hosted August 23-24, and included a sponsor-only poker tournament and the charity rodeo. In total, over the seven years of the Roughstock event, more than $1.6 million has been raised. Curtis Glencross was joined by several event organizers on November 23 at Ronald McDonald House to present cheques to the event beneficiaries. The funds delivered to the Ronald McDonald House go towards serving families, keeping the House operational – and ensuring that there are rooms available whenever they are needed. “This significant donation benefits every single family who will need the Ronald McDonald House this year”, said Jason Evanson, CEO of Ronald McDonald House Charities Alberta, “Their support over the past seven years translates over 4,700 nights of comfort for families – their impact on Albertans facing serious childhood illness or injury is profound. The Glencross family, and their friends, are lifelines for the families of the Ronald McDonald House”. For the Hockey Alberta Foundation and Hockey Alberta, this funding goes to the Every Kid Every Community (EKEC) program. EKEC has a goal of ensuring a pathway to play hockey for any child in Alberta who is interested in the sport. Host an EKEC Speaker Series in your community! RED DEER - The Hockey Alberta Foundation is seeking communities across the province to host an EKEC Speaker Series, benefiting both the Every Kid Every Community program, and your local Minor Hockey Association. The event could be a luncheon, pub night, or breakfast event, and could include a silent or live auction, raffle, and a hockey hotstove with current or former NHL players. Past events have featured Jason Strudwick, Brian Trottier, Rob Brown and Jamie McLennan. All costs for the event are covered by the Hockey Alberta Foundation, and fifty per cent of the proceeds will go directly to your local MHA. Minor Hockey Associations that have previously hosted events include Calgary, Calmar, Grande Prairie, Lethbridge, Medicine Hat, Olds, and Red Deer. For more information on hosting an EKEC Speaker Series in your community, please contact foundation@hockeyalberta.ca. CANMORE – Sixteen youths from the Boys and Girls Club of Calgary, many of whom had never skated or played golf before, are the beneficiaries of the Hockey Alberta Foundation’s 2018 Rinks to Links program. The group had the unique experience of a trip to the mountains on Tuesday, July 24 to the Stewart Creek Golf & Country Club in Canmore, and the Fenlands Banff Recreation Centre. The day started with a bus trip to Canmore, where the kids hit the driving range and putting green at Stewart Creek, with a lesson from the course professionals. After lunch, the group made the quick trip over to Fenlands Banff Recreation Centre, where each participant was outfitted with a full set of hockey equipment, provided by Comrie’s Sports Equipment Bank in Calgary. The kids then hit the ice for a one-hour introduction to hockey, with instruction from Hockey Alberta staff, and numerous volunteers, including members of the Canmore Eagles coaching staff. On behalf of all Rinks to Links participants, the Hockey Alberta Foundation would like to thank presenting sponsor, ATB Investor Services, as well as the Stewart Creek Golf & Country Club, Comrie’s Sports Equipment Bank and the Canmore Eagles for their support. CALMAR - The Hockey Alberta Foundation, along with Calmar Minor Hockey Association are excited to announce the CMHA Comedy Night and Speaker Series featuring Rob Brown and Jason Strudwick on April 21. The event runs on Saturday, April 21 at the Calmar Curling Rink. Tickets to the event are $40 each, or $320 for a table of eight (includes dinner). Doors open at 5 p.m. at the Calmar Curling Club, dinner will be served at 6, followed by a comedy show at 7:30, an auction at 9, and a Hockey Hot Stove with Brown and Strudwick at 9:30, and a dance to follow. Proceeds from this event will go towards the Every Kid Every Community program and the Calmar Minor Hockey Association. OLDS – The Hockey Alberta Foundation is excited to announce Edmonton Oilers Vice President of Hockey Operations, Craig MacTavish as a guest speaker for the EKEC Speaker Series in Olds. MacTavish will join Calgary Flames President of Hockey Operations, Brian Burke, who was announced as a guest speaker in December. The event runs on February 2 at the Pomeroy Inn and Suites in Olds, as well the Olds Sportsplex, in conjunction with the Olds Grizzlys game against the Camrose Kodiaks. Olds Minor Hockey Association, Olds College Broncos, and Olds Grizzlys have partnered with the Foundation to make this entertaining evening possible. Tickets to the event are $50 each, or $400 for a table of eight. Complimentary shuttle service from the Pomeroy to the Olds Sportsplex for the Grizzlys game from 7:30-8:30 p.m. Doors open at 5:00 p.m. at the Pomeroy, with a Hockey Hot Stove set for 6:15 with Burke and MacTavish. The event also features a silent auction and a 50/50 draw. Tickets also include admission to the Grizzlys game. Following the Hot Stove, a shuttle service to the Olds Sportsplex will be provided from 7:30-8:30 p.m. to attend the game, with an autograph session available in the first intermission. Proceeds from this event will go towards the Every Kid Every Community program, Olds Minor Hockey, the Olds College Broncos and the Olds Grizzlys. For more information about Every Kid Every Community, please click here. RED DEER - The Hockey Alberta Foundation is excited to once again partner with the Piper Creek Optimist Club of Red Deer to present the Battle of Alberta Fundraiser, benefiting the Every Kid Every Community (EKEC) program. Last year’s inaugural Battle of Alberta event raised $20,000 for EKEC. The event runs on Saturday, January 6 at Bo’s Bar and Grill in Red Deer, in conjunction with the Toronto Maple Leafs (5 p.m.) and Calgary Flames (8 p.m.) on Hockey Night in Canada. Red Deer Rebels game-day host, Troy Gillard, will be the night’s Master of Ceremonies. The night will also feature a Hockey Hot Stove with Rob Brown, Curtis Glencross, and additional NHL alumni (to be confirmed). Four tickets to the January 25 Edmonton Oilers game against the Calgary Flames at Rogers Place, and a limo ride from Red Deer to Edmonton, and back. Four tickets to the March 31 Calgary Flames game against the Edmonton Oilers at the Scotiabank Saddledome, and a limo ride from Red Deer to Calgary, and back. Only 375 tickets are available, and are sold on a first come, first served basis. To purchase tickets, or for more information, please email pcobattleofalberta@gmail.com. The Hockey Alberta Foundation would like to thank all of the generous sponsors of this event: the Piper Creek Optimist Club of Red Deer, Bo’s Bar and Grill, Edmonton Oilers Community Foundation, Calgary Flames Foundation, ATB Financial, ATB Investor Services, McCaw’s Drilling & Blasting Ltd., WestJet, the Molson Coors Brewing Company, Your Wedding Place and the FrèreRealty Team. Another thank you goes out to the silent auction and door prize sponsors: Longball Inc, Stewart Creek Golf Club, Ryde RD, YogaNation, Troubled Monk Brewery, Famoso Red Deer, Red Deer Rebels, Calgary Hitmen, Heritage Lanes, Hansen Distillery, Cold Garden Beverage Company, Wild Rose Brewery, Tool Shed Brewing Company, Annex Ale Project, Last Best Brewing and Distilling, Coulee Brew Co, Stone Heart Distillery, Alley Kat Brewing Co, and Folding Mountain Brewing. 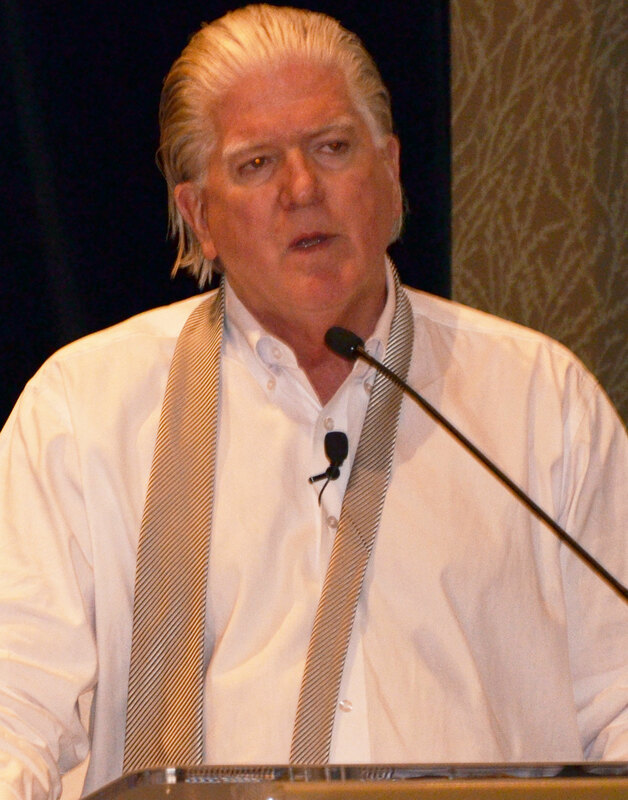 OLDS – The Hockey Alberta Foundation is excited to announce the Every Kid Every Community Speaker Series in Olds with Calgary Flames President of Hockey Operations Brian Burke. RED DEER - The Hockey Alberta Foundation is proud to recognize Q2 Artificial Lift Services as its TEAMMATE of the Month for October. Q2 Artificial Lift Services (Quinns Energy Group of Companies) has been a TEAMMATE of the Hockey Alberta Foundation and the Every Kid Every Community Program for four years, and is a major sponsor of the Hockey Alberta Foundation Golf Classic - the Foundation’s largest fundraising event each year. The Hockey Alberta Foundation would like the thank Q2 Artificial Lift Services for their ongoing support, helping assist thousands of kids across the province through their generous donation over the past four years. RED DEER - For the sixth straight year, the Glencross Invitational Charity Roughstock Event was a success, with $190,000 going to the Hockey Alberta Foundation and the Ronald McDonald House Charities® Central Alberta. Curtis Glencross, and representatives from the event, were in attendance at the Ronald McDonald House in Red Deer on September 27 to present cheques to the two beneficiaries of the event. The event, a sponsor-only poker event, and the charity rodeo, ran August 24-25, with all proceeds – a total of $190,000 – donated to the two organizations. With this year’s contribution, the event has now surpassed the $1.4 million mark in its six-year history. "We’re really excited, we found a few ways this year to raise a little more money, and cut a few costs, so it was nice that would could come out and raise $190,000 this year, we’re about $40,000 up from last year, so it was a huge success for us again this year," said Curtis Glencross. "As long as we can keep building it, and keep making it grow and raise the money we can, it’s two great causes that we support, so no matter how much work it is, at the end of the day, it’s pretty rewarding that we can come and give out a cheque like this to these two great charities." The Hockey Alberta Foundation has been a benificiary of the event since its inception, with the money coming in earmarked for the Every Kid Every Community Program. "We’re very appreciative of Curtis, his family, and his committee and sponsors," said Tim Leer, Executive Director of the Hockey Alberta Foundation. "The work we do as a charity, doesn’t happen without what we call "Teammates". Whether the Teammate is a sponsor, donor, or partner event, we can’t do what we do without great Teammates, and certainly Curtis and his crew are great Teammates." Since the creation of the Every Kid Every Community program in 2011, more than $300,000 has been distributed to groups focused on creating access to hockey across Alberta. More importantly, the funds have increased access to hockey in 36 communities and for more than 3,500 kids. RED DEER - The Hockey Alberta Foundation is pleased to announce the recipients of the 2017 Future Leaders Scholarship. Eight outstanding post-secondary students were chosen from the 2017 Future Leaders Development Program to receive a $1,000 scholarship, with the opportunity to receive an additional scholarship for acheiving "distinguished leader" status. RED DEER - The Hockey Alberta Foundation is proud to recognize the Glencross Invitational Charity Roughtstock Event as its TEAMMATE of the Month for September. Spearheaded by former NHL player Curtis Glencross, the sixth annual event ran on August 25, raising money for the Every Kid Every Community program, as well as Ronald McDonald House Central Alberta. The portion of the proceeds donated to the Hockey Alberta Foundation is done so through the Glencross Legacy Fund. The Hockey Alberta Foundation would like to thank the Glencross Invitational Charity Roughstock Event for their support of the Every Kid Every Community program, and for being a great TEAMMATE! RED DEER – The Every Kid Every Community program has over $100,000 coming its way, thanks to the Alberta Hockey Hall of Fame Awards Gala and Hockey Alberta Foundation Golf Classic, presented by ATB Investor Services. The three-day fundraising event in Canmore began on July 23 with the AHHF Awards Gala at the Coast Hotel, which raised just over $9,100 through a wine pull, silent auction, and live auction. The 12th annual HAF Golf Classic, presented by ATB Investor Services, ran July 24th and 25th at the Stewart Creek Golf Club, bringing in more than $92,000 – a large part of that coming from the Talking Goalie’s fundraising effort. The Talking Goalie (Rob Kerr from Sportsnet 960 in Calgary) withstood a barrage of shots from golfers throughout the day, raising $10,100, with challengers opting to show their support to either the Calgary Flames or Edmonton Oilers. The Calgary Flames Foundation then tripled the amount raised in their name, and the Edmonton Oilers Community Foundation doubled the amount raised in their name, bringing the grand total of funds raised by the Talking Goalie to $26,300. The Hockey Alberta Foundation would like to thank all those who showed their support for the Hockey Alberta Foundation and Every Kid Every Community program, helping to get more kids across the province into hockey. A special thank-you goes out to the Flames Foundation and Edmonton Oilers Community Foundation for their charity challenge contributions. The Foundation would also like to thank its title sponsor, ATB Investor Services, key contributing sponsors Vada Capital, Quinn’s Energy, Collins Barrow, ATB Financial, and the Western Hockey League, and in-kind sponsors Golf Town and Freeman Audio Visual for their continued support. For photos from both events, click here. In nine words, one of the 33 participants summed up the 2017 Rinks to Links program, hosted by the Hockey Alberta Foundation on July 25 in Canmore. The participants were youths from Calgary, most of whom had never played golf or skated before, and it was a day none will ever forget. The day started with a bus trip to Canmore, where the kids hit the driving range and putting green at the Stewart Creek Golf Club, with a lesson from the course professionals. After lunch, the group made the quick trip over to the Canmore Recreation Centre, where each participant was outfitted with a full set of hockey equipment, provided by Comrie’s Sports Equipment Bank in Calgary. The kids then hit the ice for a one-hour introduction to hockey, with instruction from Hockey Alberta staff, and numerous volunteers, including members and staff of the Canmore Eagles. On behalf of all Rinks to Links participants, the Hockey Alberta Foundation would like to thank presenting sponsor, ATB Investor Services, as well as SportCentral in Edmonton, Tundra Process Solutions, Stewart Creek Golf Club and the Canmore Eagles for their support. CANMORE - Five outstanding individuals, and perhaps one of the most celebrated families in all of hockey comprise the 2017 Induction Class for the Alberta Hockey Hall of Fame (AHHF). 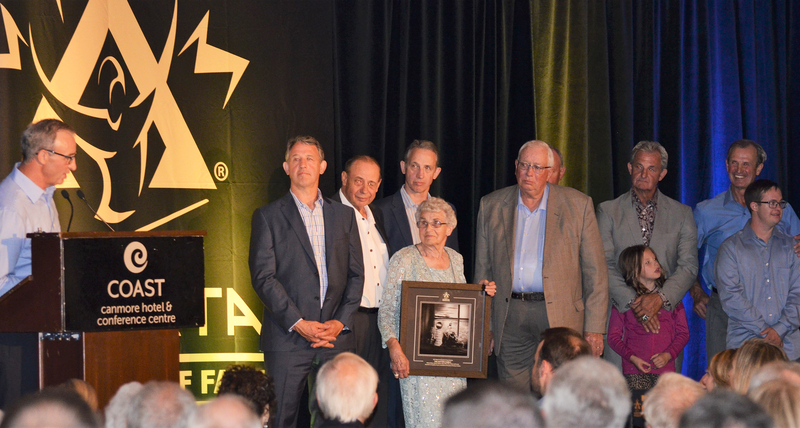 Mel Davidson, Bill Hay, Tony Kollman, Perry Pearn, Glen Sather, and the entire Sutter family were enshrined in Alberta’s hockey history on Sunday night at the AHHF Awards Gala, held at the Coast Hotel in Canmore. Mel Davidson is probably best known for her work behind the bench of the Canadian Women’s national team that won Olympic gold medals in 2002 (Salt Lake City, Assistant Coach), 2006 (Torino, Head Coach), and 2010 (Vancouver, Head Coach). She was inducted into the Canadian Olympic Hall of Fame in 2011. Click here for Davidson’s full bio. Bill Hay arguably enjoyed a hall of fame career at the junior, collegiate and professional levels, with many significant achievements over his 16 years on the ice. But when his accomplishments and work off-the-ice are included, he has had a major impact on the sport of hockey – in Alberta, across Canada and around the world. Click here for Hay’s full bio. Few have matched the legacy left by Tony Kollman on amateur hockey in Alberta in the 1960s and 70s. In another era, he might have been a star at the professional level. For Kollman, his profession as a hospital administrator meant that his hockey skills would be largely on display in Alberta, with appearances at the national and international levels. Click here for Kollman’s full bio. Perry Pearn was a national champion as a player. But it is through his continuing role as a coach at the collegiate, international and NHL levels for more than four decades that he made his biggest impact on the Alberta hockey community. Click here for Pearn’s full bio. 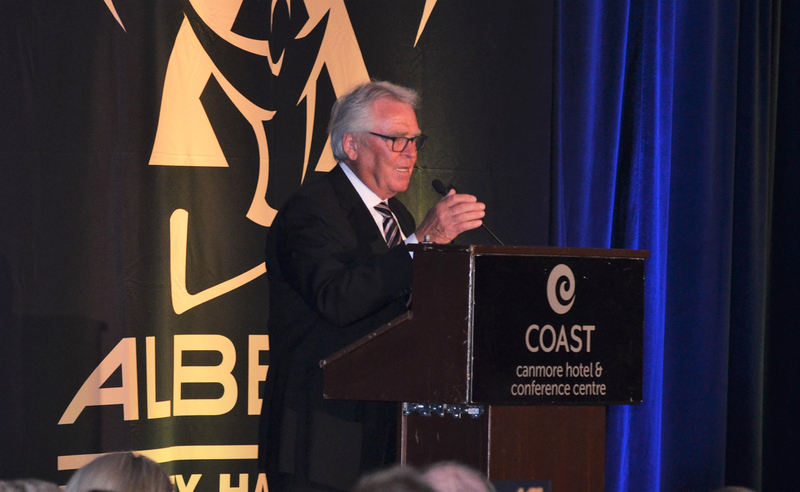 With 18 games remaining in the 1976-77 World Hockey Association season, Glen Sather assumed the dual role of player-coach with the Edmonton Oilers – a rather unheralded start to one of the most successful careers as a head coach, general manager and president in the National Hockey League. 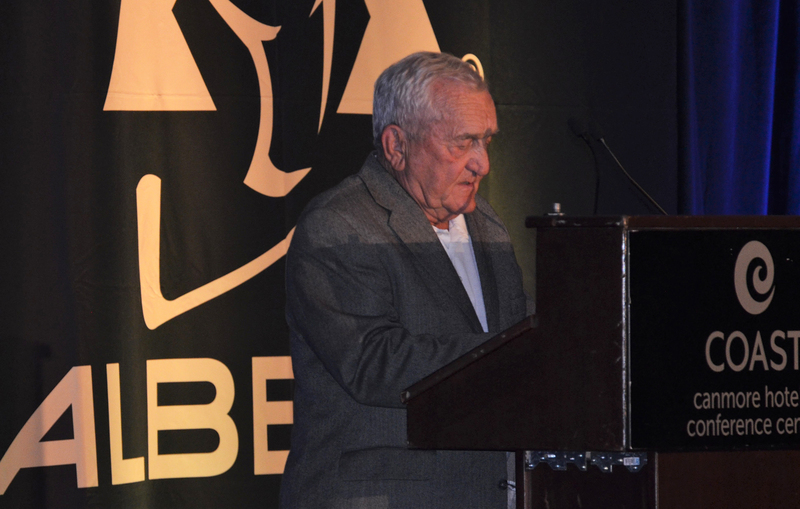 To date, Glen has been enshrined in the Hockey Hall of Fame (1997), the Alberta Sports Hall of Fame (1996), and the World Hockey Association Hall of Fame (2010). Click here for Sather’s full bio. For any hockey fan in central Alberta, and especially in their hometown of Viking, when you say the names Brent, Brian, Darryl, Duane, Gary, Rich, Ron, Grace and Louis, the last name isn’t necessary. They are, simply, the best known, most recognizable and most famous hockey family in the world – the Sutter Family. Six brothers played in the National Hockey League. Four of them went on to become coaches and/or general managers. Click here for the Sutter family’s full bio. Sunday’s AHHF Gala kicked off in the afternoon with a VIP reception for the 2017 inductees, and included dinner and the awards presentation. The 2017 Alberta Hockey Hall of Fame Awards Gala is presented by the Hockey Alberta Foundation, Hockey Alberta, and ATB Investor Services. The 2017 Alberta Hockey Hall of Fame Awards Gala runs in conjunction with the Hockey Alberta Foundation Golf Classic, a key fundraiser for the Hockey Alberta Foundation’s Every Kid Every Community Program. The 12th annual Golf Classic also takes place in Canmore, beginning Monday evening with a special reception for all participants, as well the celebrity golfers. The tournament goes Tuesday at the Stewart Creek Golf Club. Celebrity golfers include Mel Davidson, Perry Pearn, Jamie McLennan, Rob Brown, Curtis Glencross and more. For the 11th consecutive year, ATB Investor Services is the presenting sponsor of the Golf Classic. In addition to the Golf Classic, Stewart Creek will also host the first half of the Hockey Alberta Foundation’s annual Rinks to Links program on Tuesday morning, where 30 first-time hockey players will take part in a golf lesson. From there, the participants will head to the Canmore Recreation Centre to be outfitted head-to-toe with new equipment, and take to the ice for the very first time. The Every Kid Every Community program was launched in 2011, with the goal of ensuring a gateway to play hockey for any child in Alberta who is interested in the sport. The goal is to provide every child in Alberta the opportunity to play hockey, have fun and, in many cases, experience the sport for the first time. Funding through Every Kid Every Community is available to assist amateur sports organizations, minor hockey organizations, youth groups, recreation groups, or any community group with an idea, project or program that helps establish an event or program to get local children active in hockey. RED DEER - The Hockey Alberta Foundation is proud to recognize ATB Investor Services as its TEAMMATE of the month for July. ATB Investor Services is a long-time partner of the Hockey Alberta Foundation, and is serving as the title sponsor for the Hockey Alberta Foundation Golf Classic, which runs July 24-25 in Canmore, for the 11th straight year. “ATB Investor Services is proud to support the Hockey Alberta Foundation and the Every Kid Every Community Program,” said Chris Turchansky, President of ATB Investor Services. “EKEC gives kids across Alberta a chance to play the great game of hockey, but more importantly it teaches them about teamwork, leadership and the importance of being active." The Hockey Alberta Foundation would like to thank ATB Investor Services for their support of the Every Kid Every Community program, and for being a great TEAMMATE! RED DEER - The Hockey Alberta Foundation is proud to recognize Sport Central as its TEAMMATE of the month for June. The Hockey Alberta Foundation and Sport Central first partnered together in 2014. Sport Central’s goal is to gather, recycle and redistribute sports equipment to children who would otherwise be denied the opportunity to participate in sports, which aligns with the Hockey Alberta Foundation’s Every Kid Every Community program. "With funding from the (Hockey Alberta) Foundation, over 20 different communities across northern Alberta have received needed sports equipment and support," said Sheldon Oleksyn, Executive Director of Sport Central. "In many of these communities, registrations in Minor Hockey have shot-up overnight as a result. In the rest, hundreds of low-income children without the resources to play have been able to get into the game for the first time. They confirm the fact that accessible equipment means access to the game. Equipment is a key catalyst to participation." Sport Central was formed in Edmonton in 1991, and has since provided over 125,000 low-income families with the necessary equipment to participate in the sport of their choice. "Funding by the Hockey Alberta Foundation has extended the reach of Sport Central’s Outreach Program," said Oleksyn. "The Program has fingers across Northern Alberta to communities requesting help to get more disadvantaged children into the game. With Hockey Alberta having connections into every community from Red Deer to the north, and the equipment needs supplied by Sport Central, a joint partnership between us has shown impressive results over the past three years! Thank you Hockey Alberta Foundation for your leadership and initiative!" The Hockey Alberta Foundation would like to thank Sport Central for their support of the Every Kid Every Community program, and for being a great TEAMMATE! RED DEER – The Hockey Alberta Foundation is proud to recognize ATB Financial as its very first Teammate of the Month. ATB Financial has been a long-standing partner and supporter of the Hockey Alberta Foundation, assisting in getting more kids involved in hockey across the province. In addition to the Hockey Alberta Foundation, ATB Financial has been a long-time partner of Hockey Alberta. After three years as the title sponsor of the Alberta Cup, Alberta Challenge and Peewee Prospects Cup, ATB just wrapped up its second year as the presenting sponsor of the Hockey Alberta Provincial Championships. Not only does ATB Financial stand strongly behind Hockey Alberta and the Hockey Alberta Foundation, but they are a major advocate for hockey in our province in many ways, with numerous partnerships and initiatives in place to celebrate and grow the game in Alberta at the grassroots level. For these reasons, and more, we would like to thank ATB Financial for being an amazing Teammate! RED DEER - Hockey Alberta and the Hockey Alberta Foundation are pleased to announce Brady Bakke and Tricia Van Vaerenbergh as distinguished Future Leaders. Bakke and Van Vaerenbergh are among the eight post-secondary students accepted into the 2016 Future Leader Development Program, which saw them fill a role during the U16 Male & U16 Female Provincial Camps in Camrose in July 2016. Both were selected as distinguished future leaders for their leadership, professionalism, enthusiasm and willingness to give back to the game of hockey. Bakke, a Red Deer native, is in his second year playing for Concordia University, following three years with the Bonnyville Pontiacs of the Alberta Junior Hockey League, and two years of Midget AAA in Red Deer. Van Vaerenbergh, orginally from Picture Butte, is in her second year at the University of Lethbridge, and previously skated for Team Alberta’s bronze medal-winning team at the U18 Nationals in 2013. In addition to the original $1,000 scholarship awarded to participants of the program, the two distinguished Future Leaders will each receive an additional $3,000 scholarship. Applications are still being accepted for the 2017 Future Leaders Development Program. The application deadline is April 12, and the FLDP runs April 28-30 in Sylvan Lake. For more information on the Future Leaders Development Program, click here. RED DEER – Five outstanding individuals, and perhaps one of the most celebrated families in all of hockey comprise the 2017 Induction Class for the Alberta Hockey Hall of Fame (AHHF). 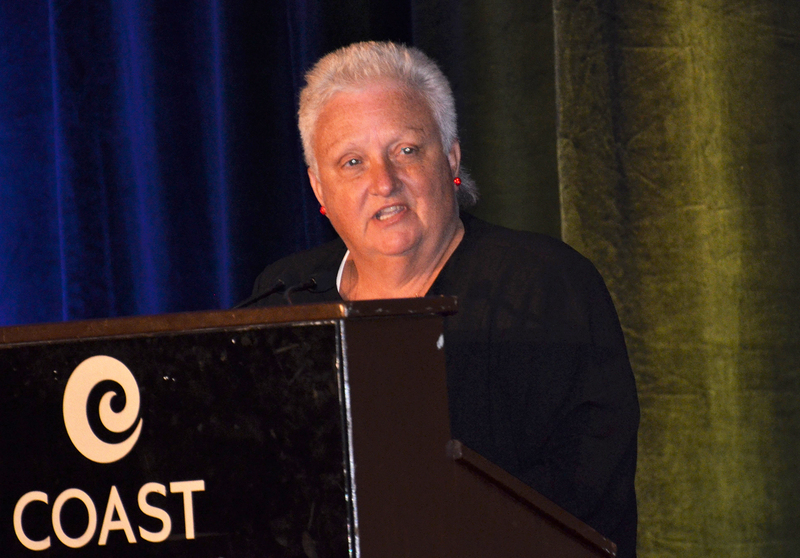 Mel Davidson, three-time Olympic gold medalist (Head Coach, Canadian Women’s national team). Perry Pearn, second-winningest coach in ACAC history, including six ACAC championships. The Sutter family – Brent, Brian, Darryl, Duane, Gary, Rich, Ron, Grace and Louis. Teammates Helping Teammates - Win 25 tickets to see the Calgary Flames! As the hockey season winds down and your team ponders how to spend its remaining funds, we’re asking you to consider your teammates at the Hockey Alberta Foundation. The Hockey Alberta Foundation has launched a raffle in support of the Every Kid Every Community Program. There are only 100 tickets available. Tickets are available for $100 each and can be purchased by cash, cheque or credit card by contacting the Hockey Alberta Foundation office. Not part of a Minor Hockey team? You can still purchase a ticket, and bring your 24 closest friends to the game! 25 tickets to the Calgary Flames vs LA Kings game on Wednesday, March 29th, 2017. For teams outside Calgary city limits, a Brewster bus providing travel to and from the Scotiabank Saddledome. Tickets are available until March 22, or until all 100 tickets are sold. Draws will take place at 2:00 p.m. MST on March 23 at the Hockey Alberta office. Buy your ticket today and help us raise $10,000 for the Every Kid Every Community! If you have any questions about the Teammates Helping Teammates raffle, please email Holly Martin. RED DEER – After a cross-province tour with stops at all five of Alberta’s Western Hockey League teams, the Talking Goalie has raised a total of $3100 for the Hockey Alberta Foundation’s Every Kid Every Community program. With a donation to the EKEC program, WHL fans had the chance to take their best shot on the Talking Goalie (Rob Kerr of Sportsnet 960 The Fan), and whether they silenced him or not, walked away with a commemorative t-shirt courtesy of ATB Financial. The Hockey Alberta Foundation would like to thank the Western Hockey League, Edmonton Oil Kings, Lethbridge Hurricanes, Calgary Hitmen,Red Deer Rebels and Medicine Hat Tigers for their support, as well as all of the fans who tried to silence the Talking Goalie. LETHBRIDGE – The Hockey Alberta Foundation is excited to announce the next installment in the Every Kid Every Community Speaker Series, set for Saturday, May 13 in Lethbridge, featuring Jamie McLennan, Rob Brown and Jason Strudwick. The lunch event is in support of the Hockey Alberta Foundation’s Every Kid Every Community Program and the Lethbridge Minor Hockey Association, and will run in conjunction with the Peewee Prospects Cup. Tickets are $65 each, or $475 for a table of 8. Sponsorship opportunities are available for this event. For sponsorship details, click here. The Hockey Alberta Foundation and Lethbridge Minor Hockey Association would like to thank ATB Investor Services for sponsoring the EKEC Speaker Series, as well as the Guest Speaker Sponsor, ATB Financial. For ticket or sponsorship information, please contact Tracey Carlson with LHMA at 403-320-0745 or email lmhaprom@telus.net. The EKEC Speaker Series is a homecoming of sorts for McLennan, who spent three seasons in net for the Lethbridge Hurricanes of the WHL. He went on to play professional hockey for 17 years, including 12 in the NHL for the New York Islanders, St. Louis Blues, Minnesota Wild, Calgary Flames, New York Rangers, and Florida Panthers. Following his retirement from the NHL, McLennan was named as the director of goaltender development and a professional scout for the Calgary Flames, and later spent time as a Flames Assistant Coach. He’s since turned his attention to his broadcasting career, serving as a full-time Analyst on TSN and a co-host on TSN Radio 1050’s Overdrive, and is a colour commentator for the Toronto Maple Leafs and Ottawa Senators, while also lending his time to the NHL Network and The Hockey News. After highly-successful four year career in the WHL with Kamloops, Brown played professional hockey from 1987-2003, 11 of those in the NHL with the Pittsburgh Penguins, Hartford Whalers, Chicago Blackhawks and Los Angeles Kings. His career highlights include setting the WHL records for assists (136) and points (212) in a season, which led to a WHL MVP award, WHL Top Scorer Award, the inaugural WHL Plus-Minus Award, and the CHL Player of the Year award. The following year, Brown won a gold medal with Team Canada at the 1988 World Junior Ice Hockey Championships. Brown can now be heard on 630 CHED as an analyst for the Edmonton Oilers, or on Oilers pay-per-view as the colour commentator. Another former Kamloops Blazer, Strudwick’s 18 year playing career saw him play 14 seasons in the NHL with the New York Islanders, Vancouver Canucks, Chicago Blackhawks, New York Rangers, and his hometown Edmonton Oilers. After retiring from professional hockey, Strudwick found his calling as a broadcaster. He’s a frequent contributor on TSN 1260 in Edmonton, in addition to co-hosting Dinner Television on City TV Edmonton. Piper Creek Optimist Club President Kevin Walsh (left) presented Hockey Alberta Foundation Executive Director Tim Leer with a cheque for $20,000 for the Every Kid Every Community program. RED DEER – The Piper Creek Optimist Club of Red Deer’s Battle of Alberta fundraiser for the Every Kid Every Community program was a major success, with $20,000 going to the Hockey Alberta Foundation. The event was held Saturday, January 7 at Bo’s Bar and Grill in Red Deer, with Edmonton Oilers and Calgary Flames fans gathering for a night of hockey, stories, and a chance to win tickets to see the Battle of Alberta in Edmonton on January 14, and in Calgary on January 21. The night was hosted by Hockey Alberta Foundation Board Member and Afternoon Host on Sportsnet 960 The Fan, Rob Kerr. Special guests Curtis Glencross and Mike Moller were also in attendance, and treated the crowd to a story-telling hot stove, swapping their favourite Battle of Alberta stories. Rayna Becker came away with the grand prize of four tickets to see the Oilers and Flames play on January 14, with a tour of Rogers Place (both donated by the Edmonton Oilers Community Foundation), with a limo ride to the game from Red Deer and back, while Sam Dolan won the other grand prize of four tickets to see the Flames and Oilers play on January 21, with dinner on the club level of the Scotiabank Saddledome (both donated by the Calgary Flames Foundation), and a limo ride to the game from Red Deer and back. The Hockey Alberta Foundation would like to thank all of the generous sponsors of this event: the Piper Creek Optimist Club of Red Deer, Bo’s Bar and Grill, Edmonton Oilers Community Foundation, Calgary Flames Foundation, ATB Financial, WestJet, Molson Coors Brewing Company, Calgary Hitmen, Red Deer Rebels, McCaw’s Drilling & Blasting Ltd, Stewart Creek Golf & Country Club, Longball Inc, Your Wedding Place, Sheraton-Red Deer, Famoso Red Deer, RYDE RD, Troubled Monk Brewery, Situation Brewing, Village Brewery, Boiling Oar Brewing Company, Alley Kat, Toolshed Brewing, Blindman Brewing, and The Dandy Brewing Company. The Hockey Alberta Foundation has teamed up with the Piper Creek Optimist Club of Red Deer to present the Battle of Alberta Fundraiser, benefiting the Every Kid Every Community program. The event runs on January 7 at Bo’s Bar and Grill in Red Deer, in conjunction with the Edmonton Oilers (5 p.m.) and Calgary Flames (8 p.m.) on Hockey Night in Canada. Special guest Rob Kerr from the Fan 960 will be the night’s Master of Ceremonies. Four club seats to the January 14 Edmonton Oilers game against the Calgary Flames at Rogers Place, a “backstage” arena tour of Rogers Place (both donated by the Edmonton Oilers Community Foundation), and a limo ride from Red Deer to Edmonton, and back. Four club seats to the January 21 Calgary Flames game against the Edmonton Oilers at the Scotiabank Saddledome, dinner on the Club level of the Saddledome before the game, (both donated by the Calgary Flames Foundation), and a limo ride from Red Deer to Calgary, and back. Tickets are $25 each, which includes snacks (courtesy of Bo’s), and entry into hourly draws. the early bird draw and both grand prize draws. A WestJet raffle prize (two tickets for anywhere WestJet flies), a 50/50 draw, and silent auction items will also be available throughout the night. As the organizers of the event, the Piper Creek Optimist Club has generously allocated 100% of the proceeds to the Every Kid Every Community program, which will go specifically to help Central Alberta kids into the game of hockey. The Hockey Alberta Foundation would like to thank all of the generous sponsors of this event: the Piper Creek Optimist Club of Red Deer, Bo’s Bar and Grill, Edmonton Oilers Community Foundation, Calgary Flames Foundation, ATB Financial, WestJet, Calgary Hitmen, Red Deer Rebels, McCaw’s Drilling & Blasting Ltd, Stewart Creek Golf & Country Club, Longball Inc, Your Wedding Place, Sheraton-Red Deer, Famoso Red Deer, RYDE RD, Troubled Monk Brewery, Situation Brewing, Village Brewery, Boiling Oar Brewing Company, Alley Kat, and Dandy Brewing Company. FORT MCMURRAY – In the aftermath of devastating wildfires that impacted northeastern Alberta in May, the Fort McMurray Minor Hockey Association has emerged as a source of stability for a community filled with uncertainty. As residents returned to Fort McMurray throughout the summer, following the evacuation of nearly 90,000 people, the community was looking for any signs of normalcy. In the early going, though, there weren’t many answers. The fires and evacuation meant the association had not held its annual general meeting. Jerseys and equipment needed to be cleaned or repaired. And then there was an even bigger question – would there be a place to play? Registration numbers are down slightly (about three per cent) for the 2016-17 season. But more than 1,100 players, comprising approximately 60 teams, are on the ice. And the association is hosting Hockey Alberta’s Atom AA Major provincial championships in March. “This is fantastic. We have managed to put on a hockey program after an 88,000-person evacuation,” said Galenzoski. To help support minor hockey in the northeast, Fort McMurray minor hockey and players throughout the region are the beneficiaries of $21,500 raised collectively by Hockey Canada, Hockey Alberta, Hockey Canada Foundation and Hockey Alberta Foundation. $1,500 raised at Hockey Alberta’s 2016 annual general meeting through contributions from Local Minor Hockey Associations across Alberta. All funds will go directly towards support the players, families and coaches who were impacted by the devastating forest fires that impacted the region in May. Planned initiatives include supporting ongoing player development programs, implementing a coach development plan in partnership with Hockey Alberta’s Regional Centre network, and player assistance and growing the game initiatives. Player development programming started about six weeks ago, with a goal of having each team participate in 3-5 development sessions. The association is also looking to host division-specific sessions for goaltenders, with mentors coming in to provide development opportunities. “The Hockey Alberta Foundation, through the Every Kid Every Community program, is proud to play a role in assisting Fort McMurray Minor Hockey continue in its leadership role, not just for hockey, but within the overall community. We look forward to supporting a number of initiatives that will benefit current coaches and players, as well as those who want to play hockey for the first time,” said Tim Leer, executive director of the Hockey Alberta Foundation. Growing the game initiatives aimed at attracting new players to the game by providing equipment and helping with registration fees will be geared to recruiting for the 2017-18 season. For more information, check out the association’s website at www.fmmha.com. Contributions at the 2016 Hockey Alberta AGM included seven minor hockey associations (Caroline, Hinton, Lloydminster, Lethbridge, Grande Prairie, Hockey Edmonton and Hockey Calgary), and two individuals (Jody Ginther and Betty Chmilar). The Hockey Alberta Foundation’s 2016 Rink to Links program took place at Country Hills Golf Course and Crowfoot Arena in Calgary, giving 25 kids a chance to hit the driving range and ice all in one day. Each kid also received a full set of hockey equipment, thanks to Comrie’s Sports Equipment Bank in Calgary and United Cycle in Edmonton. A special thanks also goes out to ATB Financial and Hockey Calgary for sponsoring the event. CANMORE – Five outstanding individuals and one team are set to be enshrined in the Alberta Hockey Hall of Fame Saturday night, including former Boston Bruins legend and Hockey Hall of Fame member Johnny Bucyk. During his 22 seasons in the NHL, 21 of those with Boston, Bucyk notched 668 goals and 818 assists, finishing his career with 1369 points in 1540 games. He was twice named an NHL All-Star and Lady Byng Trophy winner, and hoisted the Stanley Cup twice with the Bruins in 1969-70, and 1971-72. Click here for Bucyk`s full bio. Joining Bucyk in the class of 2016 is Mike Rogers (retired NHL and WHA player, and former Calgary Flames broadcaster), Dr. George Kingston (internationally-renowned coach), Terry Ledingham (long-time Hockey Alberta and Hockey Canada volunteer), the 1965-66 champion Edmonton Oil Kings, and Larry Kwong, the first player of Asian descent to play in the NHL. Rogers enjoyed an impressive 12-year professional hockey career in the National Hockey League and the World Hockey Association, and followed that with another two decades as a well-respected pre- and post-game and colour commentator with the Calgary Flames. Click here for Rogers` full bio. Kingston is one of Canada’s best known and most successful coaches, with a resume that includes almost two decades at the University of Calgary, stints with five National Hockey League teams, Canada’s Olympic and national team programs, and work with five other international programs. Click here for Kingston`s full bio. Ledingham has been involved in all aspects of hockey since 1967, from being a registrar, equipment manager, sports director, and president of a local minor hockey level right up to holding key positions with Hockey Alberta and Hockey Canada. Click here for Ledingham`s full bio. The year 2016 marks the 50th anniversary for the 1965-66 Edmonton Oil Kings of winning the Memorial Cup championship in Toronto’s Maple Leaf Gardens. The Oil Kings defeated the Oshawa Generals in six games to claim the national junior championship. Click here for more on the 1965-66 Edmonton Oil Kings. Kwong played in only one game with the New York Rangers in 1947-48. But as the first player of Asian descent to play in the NHL, he broke the league’s colour barrier 10 years before Willie O’Ree, and became a hero to thousands of Chinese-Canadians, starting a change in attitudes about what a person of minority heritage could achieve in this country. Click here for Kwong`s full bio. 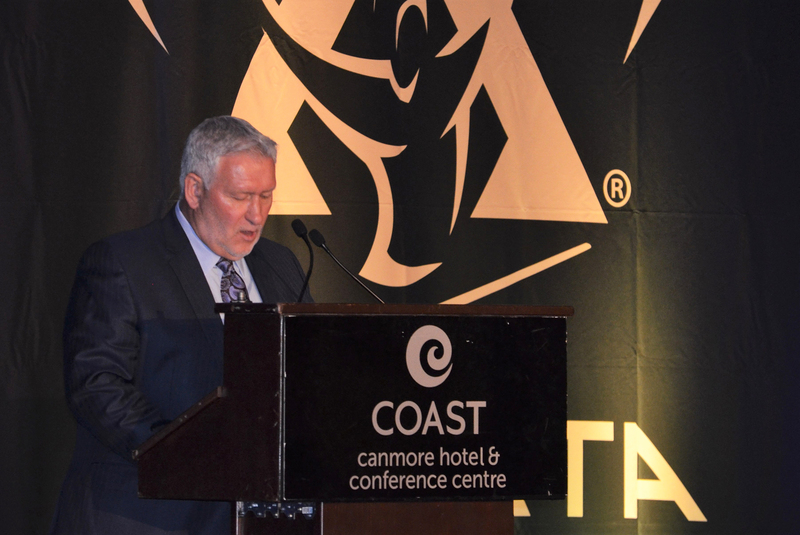 The Alberta Hockey Hall of Fame Awards Gala will be held on Saturday, July 23 at the Coast Hotel in Canmore. Doors open at 5:30 pm, with dinner at 6:30 pm followed by the Induction ceremony, and a special hockey hot stove round table to conclude the evening. In addition to recognizing the 2016 Induction Class, the Awards Gala serves as a key fundraiser for the Hockey Alberta Foundation’s Every Kid Every Community program. The EKEC program provides grants to support communities and individuals who may not have access or the ability to participate in the game of hockey. The 2016 Alberta Hockey Hall of Fame Awards Gala is presented by the Hockey Alberta Foundation, Hockey Alberta, and ATB Investor Services. RED DEER – Four individuals and one team comprise the 2016 Induction Class for the Alberta Hockey Hall of Fame (AHHF). John Bucyk, two-time Stanley Cup champion with the Boston Bruins. Mike Rogers, former captain and leading scorer of the Hartford Whalers. 1966 Edmonton Oil Kings, the 1966 Memorial Cup champions. As well, Larry Kwong, the first player of Asian descent to play in the National Hockey League will be recognized with the Founders Award for outstanding dedication and commitment to the sport of hockey in Alberta. November 27, 2018 Teammates Helping Teammates - Send your team to see the Calgary Flames! September 07, 2018 Host an EKEC Speaker Series in your community! March 14, 2017 Teammates Helping Teammates - Win 25 tickets to see the Calgary Flames!